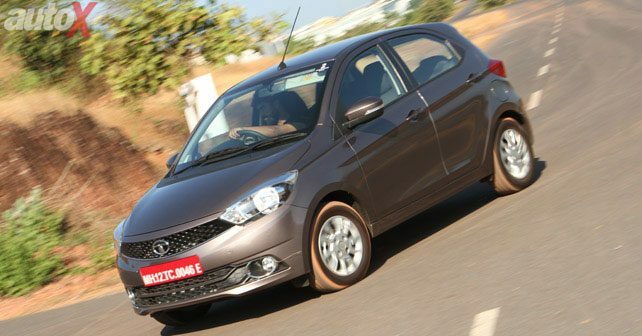 Ever since the Tiago was unveiled, it’s been touted as a game-changer for its segment as well as for Tata Motors. After having a go in the new small hatchback late in 2015, we came back quite impressed by the Tiago. Now that the hatchback is launched, and Tata has put an impressive price-tag on the car, it’s time to pitch it against its arch-rivals – Maruti Suzuki Celerio and Chevrolet Beat – in a spec-to-spec comparison. The Tiago replaces the Indica in the company’s model portfolio. But, thankfully, there’s hardly any trace of its predecessor in its design. The Tiago sports a much sharper looking and contemporary design. Muscular bonnet, honey-comb grille, large swept-back headlamps and a touch of chrome on the grille and around fog-lamps look all very sophisticated. Around the side, the Tiago gets stylish 10-spoke alloy wheels, blacked-out B-pillars and ORVMs with LED turn indicators. The rear gels well with the overall dimensions of the car featuring wraparound tail-lamps, a stubby boot and a spoiler with part black inserts above the rear windscreen. All in all, the Tiago’s design is pleasing to the eye and will attract customers of all age groups. The Tiago is also the longest and widest car among the trio here. In comparison, the Maruti Suzuki Celerio looks quite bland, thanks to its boxy dimensions. The Chevrolet Beat still looks upbeat with its sharp lines, chiseled design and compact dimensions, but it seems Chevrolet is mainly targeting youngsters with its design. Inside, the Tata Tiago marks a significant improvement over its predecessor with a completely new interior. The cabin has a nice dual-tone effect and the fit and finish of materials used feels rich and long lasting (unlike Tatas of yore). Among some of the highlights, there’s a new three-spoke steering wheel with integrated multimedia controls, twin-pod instrument cluster with a TFT driver-information display, a Harman-powered infotainment system with 8 speakers, Juke-car app, navigation, cooled glovebox, reverse parking sensors with visual display, etc.. The driver seat is height adjustable while the ORVMs can be adjusted electrically. The Tiago is easily the best equipped car here. The Celerio and the Beat miss out on features like reverse parking sensors, navigation, cooled glovebox etc. In terms of boot space, the Tiago trumps the other two with the biggest luggage capacity of 242 litres, followed by the Celerio’s boot space of 230 litres. The Beat’s luggage space of a mere 170 litres makes it the most impractical of the lot in this aspect. The Tiago is offered with a 1.2-litre, 3-cylinder petrol and a 1.05-litre, 3-cylinder diesel engine. The petrol unit produces 83bhp @ 6,000rpm and 114Nm @ 3,500rpm, whereas, the diesel engine develops 69bhp @ 4,000rpm and a peak torque of 140Nm between 1,800 rpm and 3,000rpm. Both the engines can be had with a 5-speed manual gearbox. ARAI fuel economy figures are 23.8km/l (petrol) and 27.2km/l (diesel). Powering the Celerio diesel is a 0.8-litre, 2-cylinder engine that is rated at 47bhp @ 3,500rpm and 125Nm @ 2,000rpm. Mated to a 5-speed manual, the diesel mill returns 27.6km/l, which is the highest of the trio. The petrol engine in the Celerio is a 1.0-litre, 3-cylinder K10 unit that churns out 67bhp @ 6,000rpm and 90Nm @ 3,200rpm. This engine is available with a 5-speed manual as well as an AMT autobox, returning 23.1km/l. The Chevrolet Beat petrol comes fitted with a 1.2-litre, 4-cylinder engine, developing 76.8bhp @ 6,200rpm and 106.5Nm @ 4,400rpm. The diesel engine is a 1.0-litre, 3-cylinder unit capable of producing 56.3bhp @ 4,000 rpm and 142.5Nm @ 1,750 rpm. Both the engines come with a 5-speed manual transmission. ARAI fuel efficiency figures stand at 25.44km/l (diesel) and 18.6km/l (petrol). Barring the base model, the Tiago can be equipped with optional dual front-airbags. The top-end variant comes standard with front airbags and ABS with EBD. Maruti Suzuki offers ABS and front airbags as optional extra across the Celerio range. The Chevrolet Beat gets front airbags and ABS only on the top-end LTZ variant. As you can see in the price comparison chart below, the Tata Tiago undercuts both its competitors by quite some margin. Not only that, it comes across as the most well equipped car here and has the most powerful set of diesel and petrol powertrains on offer So, on paper, the Tiago certainly seems to have got the measure of its competition.